Seit 35 Jahren arbeiten wir in Ihrem Bereich. Unser Team besteht aus internationalen Spediteuren, Transporteuren und Logistiker, die zur Realisierung der Lösung BeOne Cloud Forwarding Suite beigetragen haben, um die Informationsprozesse unserer Kunden zu verbessern. Die Geschichte von Nova Systems ist in mehrere wichtige und innovative Schritte gegliedert, welche den IT Sektor revoluzioniert haben und, daraus resultierend, auch den Sektor des Welttransportes, der Verschiffung und der Logistik. Von Lochkarten und Datenfernverarbeitung hin zu Cloud Systemen. Das neueste Ergebnis vom Nova Systems Entwicklungzentrum ist die BeOne Cloud Forwarding Suite, die IT-Loesung fuer internationale Kuriere, Transporterunternehmen und Logiker, mit seinem vielfaeltigen Anwendungspotential, und welches groessenvariabel und unabhaengig von der Betriebsgroesse ist. Wie wurde das Unternehmen gegruendet? 1981 eroeffnete sich eine neue Welt der IT-Anwendungen. Die batch-Aera endete und die der Datenfernverarbeitung began: Die Computer konnten endlich Terminals/Netzstationen mit Datenbewegungen in Echtzeit verbinden. Zu dieser Zeit war eines der Hauptunternehmen in Italien, welches einen Prozessor mit diesen Merkmalen hatte Centro S.p.a. Das Datenverarbeitungszentrum gehoerte zu Albarelli S.p.a., welches zu dieser Zeit ein bekanntes Transportunternehmen war, und von welchem ich Chef der EDP war. Fuer den Markt war es wichtig diese Anwendungen/applications zu bekommen und, nachdem wir die Ersten waren, welche Softwares in neuen Programmiersprachen programmierten, wurden wir gefragt, diese auf Datenfernverarbeitung basierenden Systeme zu verwirklichen. So gruendeten wir 1981 zusammen mit anderen Experten aus diesem Bereich Nova Systems. Von diesem Zeitpunkt an war Nova Systems immer ein Vorreiter im IT-Bereich. Drei Jahre spaeter wurden wir ein Geschaeftspartner von IBM. Bereits zu dieser Zeit benutzten wir Systeme, welche Unternehmen mit unterschiedlichen Zweigstellen ermoeglichten, sich miteinander ueber die Netzwerke, zu einem zentralen Prozessor zu verbinden. Es handelte sich um eine grundlegend innovative Art des Arbeitens. Die Transportunternehmen und die internationalen Speditionen waren am meisten an den Systemen interessiert. Von Datenfernverarbeitung zu CASE tool und cloud: Diese Evolution von Nova Systems ist gekennzeichnet durch einige wichtige und innovative Etappen. The basic steps happened in the 19990s when we were the first Italian firm to adopt CASE tool software development, which really was revolutionary at the time. At first we were considered mad by our competitors, but in the space of a few years everyone adopted our solution. However, the real turning point came about in 1998 when we introduced cloud for the first time in Italy. How did the idea of using cloud come about? That year I went to see a client in Udine. We were about to use Euros as a single currency and to enter the new millennium. In order to deal with these epochal events businesses had to undergo some onerous technical updating. "Why doesn't Nova Systems offer a solution to all its clients from a single platform and itself shoulder all the necessary investments and sharing out the costs among all its interested clients?" my client asked. That moment a spark was struck and, after six months, we began with our first cloud client. Over the year the firm has evolved notably and now it aims at internationalization, always offering its services with cloud computing. or some time we had been thinking about an international-scale solution and the fact of offering our servicing using cloud computing has led us to this kind of initiative. 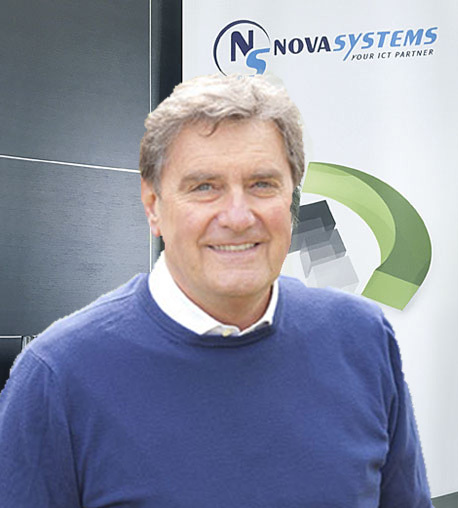 Nova Systems' main current markets are Italian, Spanish, Portuguese, and Mexican, but our firm, which already has clients in every continent, aims to open to all markets throughout the world. The aim is to create a business that is increasingly international, and that in this way gives work to many people while keeping its capital in Italy. What is Nova Systems other strong point? Firms also choose us because of our experience which derives from the fact that Nova Systems' experts come from the sector of international transporters and know perfectly the work that our clients have to undertake. This is an enormous advantage for Nova Systems in such a specialized market. To this must be added the extreme professionalism of our software technicians and the total integration of all the modules: the BeOne Cloud Forwarding Suite is the result of this; it is highly performative and secure and, in a world that is constantly evolving, it is being constantly updated with IT links to and from its agents and branch offices thus creating a database that can allow international transporters to give a prompt service to its clientele. Why was it necessary to offer your new Nova Academy service? Our clients can count on the support of the Nova Academy for continuously updating their collaborators, with scheduled courses throughout the year in which individual businesses can enroll those employees who want to improve their knowledge of the operative aspects of individual modules and of all the new functions in order to give a better answer to their clients' requests. A solution with many opportunities for firms in the sector of international shipping, logistical transporting, and logistics. What does it consist of? The BeOne Cloud Forwarding Suite is a unique solution on the market; it is integrated with all the activities that an international shipper, transporter, or logistician might need to offer their clients; air, sea, and land traffic, customs operations, accountancy, management control, business intelligence, CRM, spot offers, tariffs, and the electronic archiving of documents, all in order to guarantee their services, even via the web, with the aim of always being in the vanguard in a market in continual evolution.